Make a pentagonal-shaped box with an attached lid in various sizes with colored and black & white patterns. The boxes range in size from 3" to 1¾" and nest together for storage. 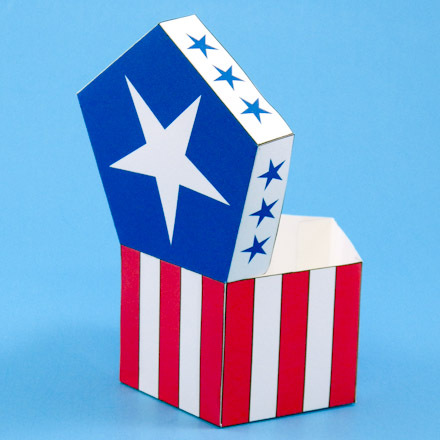 Use the boxes individually or stacked as gift boxes and favors, or for storing jewelry and other trinkets. 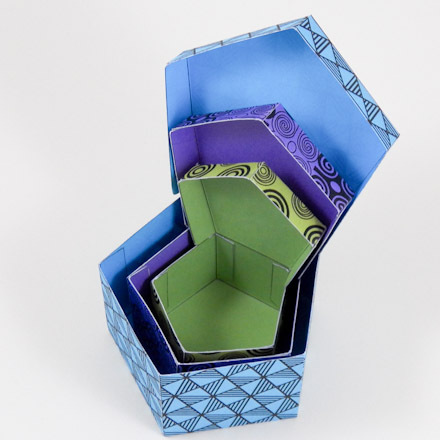 Make these cardstock boxes more substantial by adhering decorative paper to the back of the printed cardstock pattern. Then increase their durability by coating the box with an acrylic varnish. Use any of Aunt Annie's ePapers to print a sheet of decorative paper. 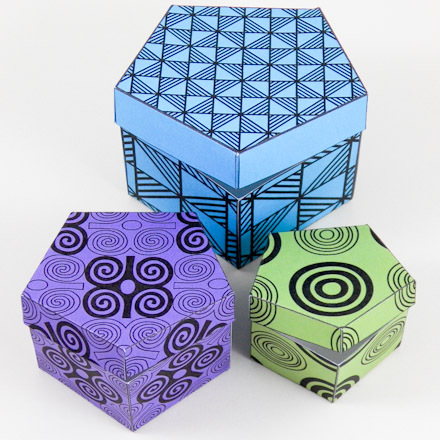 Related crafts: To make six-sided boxes, see the Hexagon Box project, and for another type of pentagon box pattern see the Five-Sided Box craft. Optional: Decorative paper, sheet adhesive, acrylic varnish, alligator hair clips. Choose a box to make. Download and print the pattern. The boxes come in three sizes with four versions of each size—plain colored, plain black & white, patterned colored, and patterned black & white. 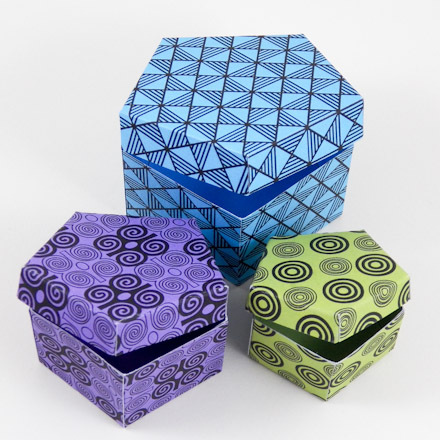 The patterned boxes feature Adinkra symbols from Ghana in West Africa. The blue box features Adinkra Mframadan, a symbol of fortitude and preparedness. 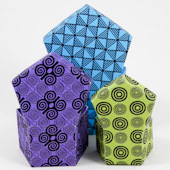 The small purple box features Adinkra Dwennimmen, a symbol of humility and strength. The small green box features Adinkra Adinkrahene, a symbol of leadership and greatness. 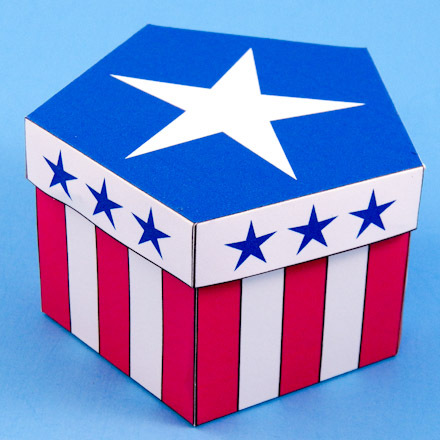 Bonus patterns: Make a patriotic-themed box with the the Stars & Stripes pattern or celebrate St. Patrick's Day with the Shamrocks pattern. 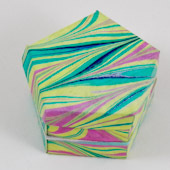 Tip: Want other colors or patterns for your boxes? Print the black & white patterns onto colored cardstock, or print the plain patterns onto patterned cardstock. 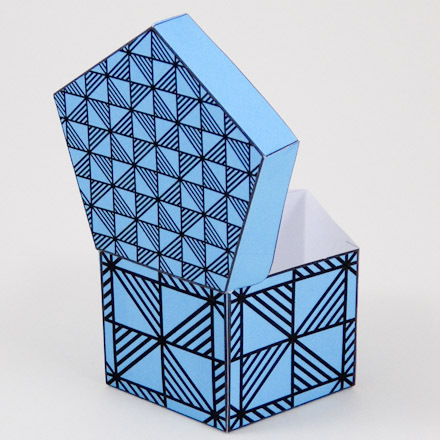 Download Aunt Annie's ePapers to print your own patterned cardstock. Cut out the box pattern on the black outline. Try to make the cuts very straight. The box will be stronger and fit together better if the cuts are straight. Turn the box with the marked lines up. Score along each of the fold lines (red in this illustration) using a bone folder or empty ballpoint pen drawn along the edge of a ruler. Fold one side along the score line, then unfold. Repeat for the other sides and glue tabs for both the box and the lid. Tip: Make all of the folds sharp by running your thumbnail or a bone folder firmly along the fold. 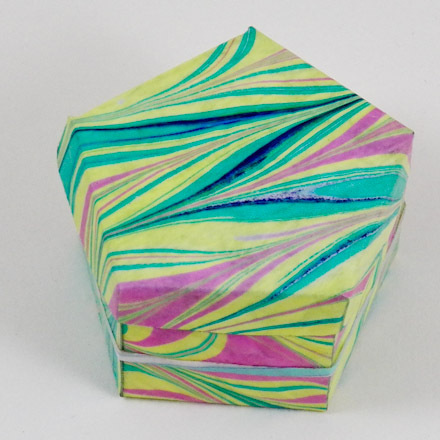 Gently shape the box sides into a pentagon shape. Be sure the glue tabs are on the inside. Glue the tabs to the sides of the box with a good craft glue. Repeat for the lid. Decorate as you please, but be sure the box bottom and lid will still go together easily. Tip: Use alligator hair clips to hold the glued joints until the glue has set. Tip: Make a box for Memorial Day or Independence Day with the Stars and Stripes pattern. 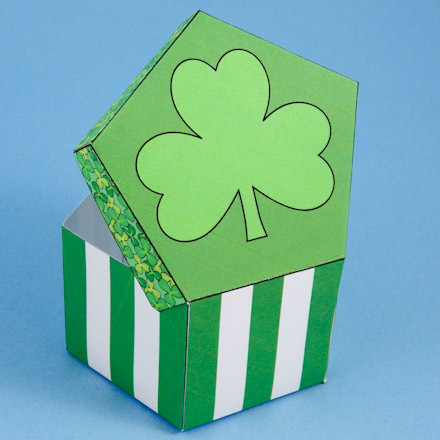 Tip: Make a box celebrating the Irish and St. Patrick's day using the Shamrocks pattern. 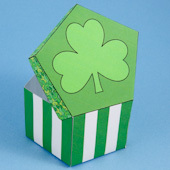 Also, checkout more St. Patrick's Day crafting fun! Tip: The Adinkra ePapers coordinate with the colors used for the boxes in this project. Nesting boxes: The three boxes in this project nest together or make a pretty stack. Tip: Print the box pattern on the reverse side of decorative cardstock. These boxes were made with Aunt Annie's Adinkra ePapers. 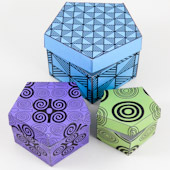 Tip: The patterned pentagon boxes use the same Adinkra symbols used on the Adinkra ePapers. Tip: Adhere decorative paper to the back of the printed cardstock pattern using sheet adhesive. This extra layer makes a more substantial box. For a glossy appearance that adds durability, coat the paper with Mod Podge or an acrylic varnish. The pictured box is more than 10 years old.